Event in Anchor & Den Restaurant - Grand Cayman - The Beach House Experience - Join us for Round Two of Chef's Cut - a delectable dining experience like no other! Join us for Round Two of Chef's Cut - a delectable dining experience like no other! Tonight is the night! we are so excited to be hosting the second edition to our “Chef’s Cut’ event. Thisunique dining experience in the intimate setting of Anchor & Den is a foodie experience like no other. Over the course of three evenings, our super talented Chefs will be hosting an impressive curated menu personally developed by the Star Chef of the night. This amazing culinary venture gives our guests the opportunity to meet the star Chefs of the Grand Cayman Marriott Beach House table side as they lead you through their journey of inspiration. 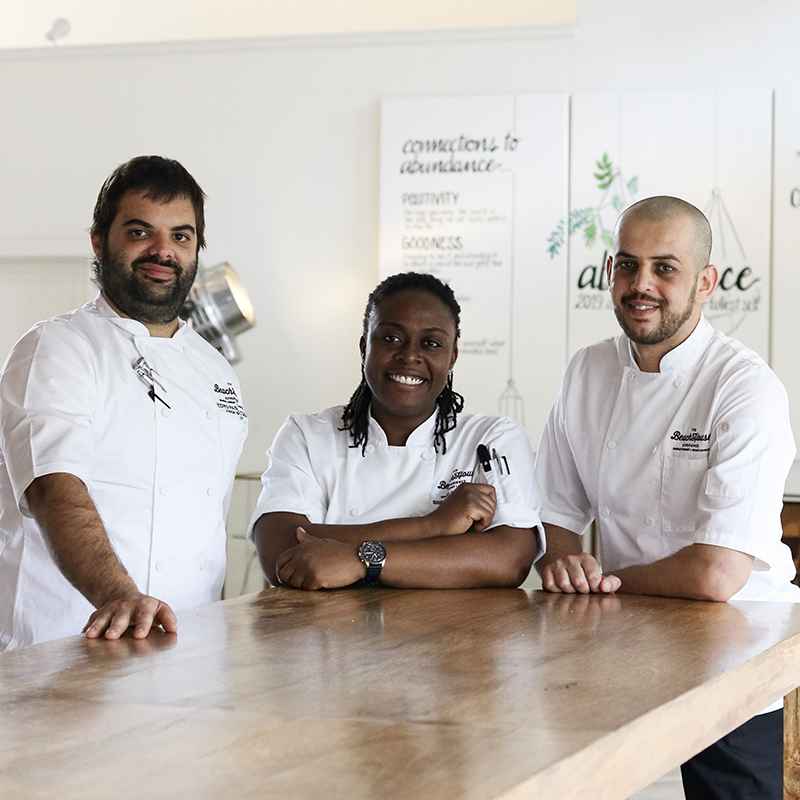 This time Chef's Cut Presents Chef Pedro Passalacqua, Chef Sherene Hutchinson and Chef Mohammad Alaidah, who will be taking guests on a unique culinary journey around the world. As our chefs prepare for what’s to come in the next 3 days, we can’t help but let our imaginations wander - the beauty of this event is you don’t know what to expect! We are very lucky to have so many cultures and authenticities working here at the Grand Cayman Marriott Beach House. At our first edition we saw plates from the heart of India, the courtside of Champagne in France to German street food. The possibilities for the second edition are endless and we just can’t wait to see what they have up their sleeves. Seats to this exclusive event are selling like hotcakes - read below to see what’s cooking on each night. Born and trained in Jordan, a country defined by ancient archaeological monuments carved into the surrounding pink sandstone cliffs and the hospitality of their people, Chef Mohammad has nearly a decade of experience working in the culinary world. He came to Grand Cayman from the Ritz Carlton Doha in Qatar two years ago. With his diverse menu, Chef Mohammad will be showcasing his memories in a crafted selection of Arabic food from different countries and seasons. He’ll use a base of traditional flavours and while respecting ancient master techniques but at the same time adding his own personal touch, he’ll take you on an authentic Arabic epicurean trip! From Palestinian winter feelings, Moroccan street food, fresh summer Lebanese vibes, traditional Jordanian fishermen food and finishing this exotic journey with one of the most famous delicacies in Middle East. Pedro is the Junior Sous Chef of Anchor & Den, the signature restaurant at our Beach House. Five years ago, he decided to move to Cayman looking for personal growth and new culinary development. Chef Pedro had Thais Rodriguez and Santiago Mancini as mentors, with them he learned the art of craft our signature experiences. Pedro has the Spanish and Italian heritage of his grandparents in his blood. Pedro’s family always gathered around the table making food a central part of their lives. His menu is a reflection of what he has learned throughout his life in many kitchens and is inspired by the influences that have fed his foodie passion for so many years. Junior Sous Chef Sherene started her foodie career after graduating from the Culinary Plus International School in Jamaica. Shortly after she graduated, she moved to Doha to be a Culinary Trainee at the Ritz-Carlton in 2010. She was so well-liked and respected in the kitchen that she was hired before her training contract ended and she stayed as part of the team, moving from strength to strength, for the next five years. In 2015, she moved back to the Caribbean and joined the Marriott Grand Cayman as a Line Cook. She was then promoted to Chef de Partie and subsequently Junior Sous Chef. Sherene won Marriott International’s Culinary Master of the Craft, where she was recognized as the best in cook in Marriott around all the continent. Please email hello@anchorandden.com to make your reservation requests.